This is where it starts: http://www.safe2tellco.org and 720-508-6800 is the phone number. 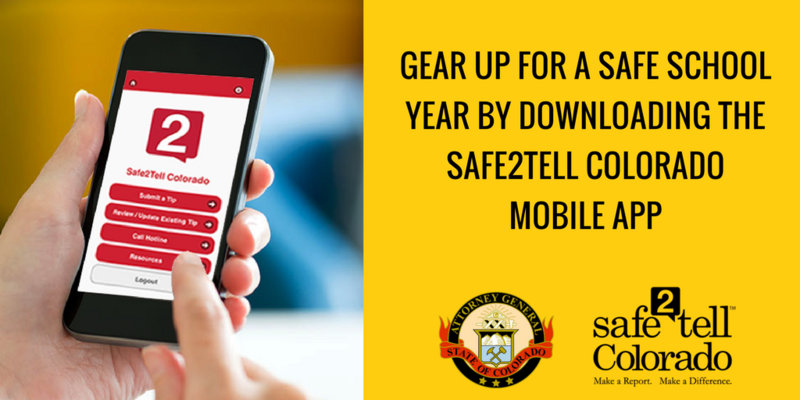 Safe2tell is a place where kids can anonymously report anything that concerns or threatens, family, friends and community. The strategy developed from the Safe2Tell Colorado model prevents tragedy and saves lives. Safe2Tell Colorado works to change attitudes by providing resources around the state to educate, equip, empathize with, empower, and engage youth. Safe2Tell Colorado works to break the code of silence through awareness, education and outreach activities. Data shows that more Safe2Tell Colorado tip reports come from schools that incorporate the Safe2Tell solution in all practices. Interesting fact: In the 2016-2017 school year, 9,163 reports were recieved and to date, over 30,000 since 2004. It seems Thursday seems to be the more popular day for this to happen with the popular time being 4 pm. Safe2Tell Colorado regularly conducts trainings and presentations to educate students, school staff, law enforcement, and community members about the Safe2Tell model. Trainings and presentations can be tailored for particular audiences.